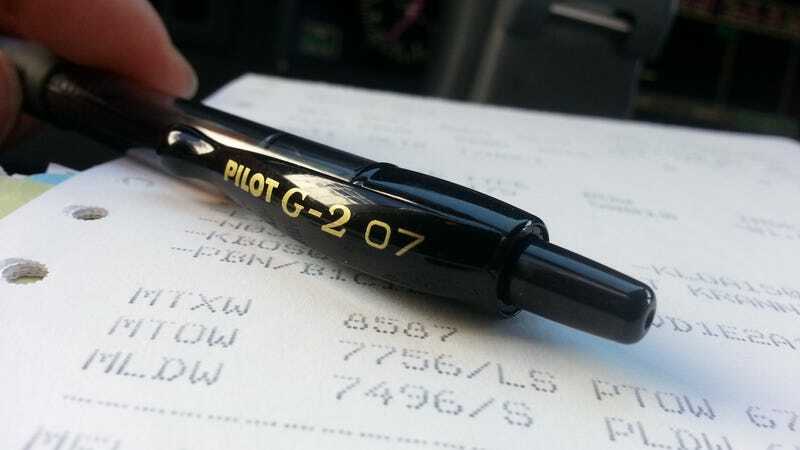 Pilots favorite pens are Pilot. At cabin altitudes around 8,000 feet a pen starts to stress. The V-ball pen has weaker internals and leaked all over me several timesbefore besides that tip wont play nice with recycled printer paper. Ball point bic types gel up when cold and write inconsistent however they are free in hotel rooms. Out of the pilots I work with and see writing I estimate 8/10 working pilots use the pictured pen in 05 or 07 tip size. It is absolutely reliable in cold or hot weather and writes easily on all paper we use. Other gel types exist but dont feel as sturdy and solid andfor the price we keep coming back to this pen. I have used Pilots up to 18,000 feet and frigid unpressurized temps without fail. Good stuff. I prefer the 05. they make an 038 tip but thats' almost a pen-knife and will cut more than write on soft recycled style or thin paper or weak surfaces.